He is one of my favorite artists and I am glad that he is my cousin. Illustration: “Afterglow” by Maxfield Parrish, 1947. Source: WikiArt. 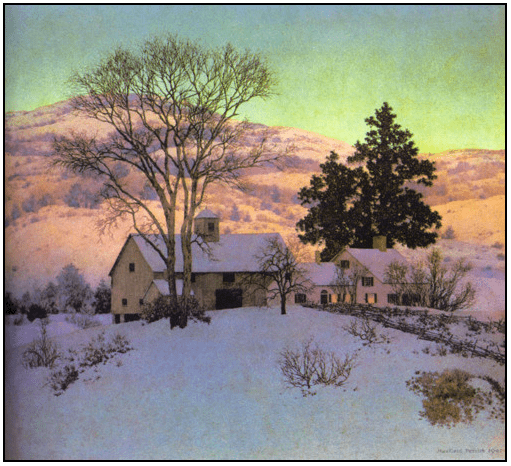 Daybreak (1922) was very popular, but Afterglow (1947) is one of my favorites because it reminds me of our home – and so many homes in New Hampshire where Parrish lived for many years. Today his paintings sell for huge sums. When Daybreak sold 25 May 2006 at auction at Christie’s for $7.6 million dollars, it set a new record for an artwork by Maxfield Parrish. You can read more about Maxfield Parrish’s family history here on FamilySearch. There are thousands of newspaper articles about Maxfield Parrish’s life and work in GenealogyBank’s Historical Newspaper Archives. Here are just a few of them. Hindman, Leslie. “Parrish Book Is a Valuable Treasure.” Aberdeen Daily News (Aberdeen, South Dakota), 22 February 2002, page 91. Maison Blanche department store advertisement. 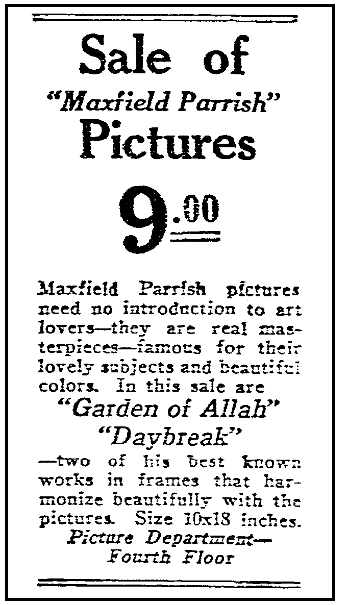 “Sale of ‘Maxfield Parrish’ Pictures.” Times Picayune (New Orleans, Louisiana), 31 January 1926, page 11. “Peregrinations of a Maxfield Parrish Mural.” Advocate (Stamford, Connecticut), 12 November 1977, page D-6. 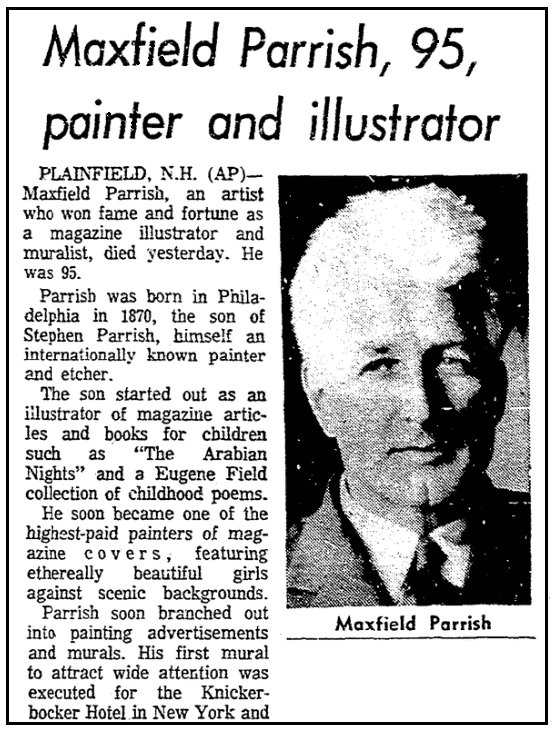 “Maxfield Parrish, 95, Painter and Illustrator.” Newark Star Ledger (Newark, New Jersey), 31 March 1966, page 19. Trott, Nancy Roberts. “He’d Turn Over in His Grave. Maxfield Parrish’s Popularity Brings Bitter Legal Battle.” Advocate (Stamford, Connecticut), 19 March 1995, page A12. This article is about a complicated legal case regarding the ownership and sale of Maxfield Parrish’s artwork.